Originally from Siberia, pelmeni's the Russian equivalent of ravioli - a little meat-filled dumpling that's boiled & served with butter & sour cream. It's widely eaten throughout the country & sold frozen in the supermarkets. Some, like this woman, still make it from scratch. This shot somewhat epitomizes [to me] how our perceptions are deeply influenced by our cultural reference points. Rustem sees this as a typical village woman making a tasty Russian delicacy. Admittedly, I'm not a fan of pelmeni - something about the meat & spices combination doesn't appeal to me. 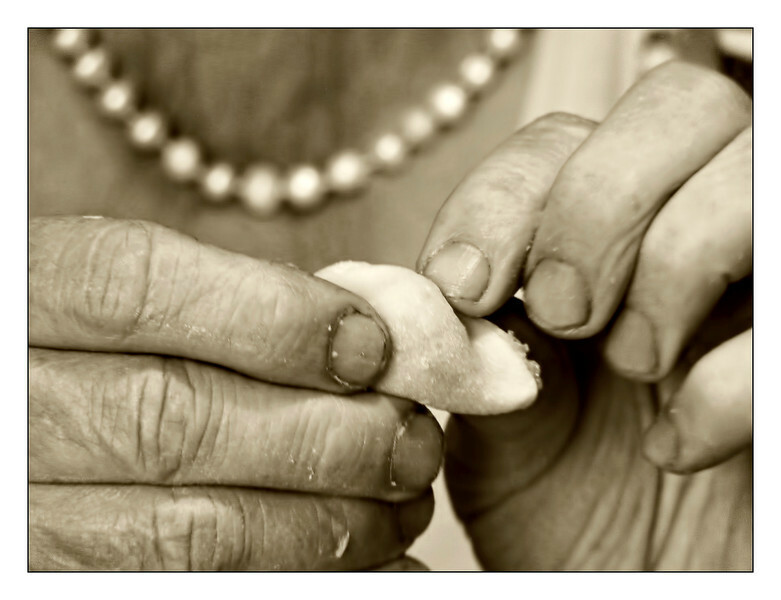 That aside, when I look at this, all I can think of is yuck, as my eyes are drawn to those short, dirty fingernails engaged in food prep and, to a lesser extent, their disparity with the imitation pearls. Thanks for you comments yesterday. great close up crop and monotone pp. Great details in the hands! Interesting... I'm going to side with you.. I don't see food, I see fingernails from hard labor.. Hands always make a great shot and this one is super.